My friend was already aware of my folklore project. While getting coffee, we were happened to be telling stories about our experiences in high school. I realized this would be perfect for this assignment. GG is the informant, PH is myself. Another friend was sitting with us, who I did not collect folklore from, but she does talk during the following collection. She is CC. Both GG and CC are from Orange County, though they were from different cities and did not know each other before attending USC. Both of their high schools had the following tradition. PH: Do you have any folklore about your school, like stories everyone would tell, or things everyone would do? The informant then told me of a legend/superstition, which is documented separately. CC: Oh, we had that too! PH: Okay, could you explain what that is? GG: You didn’t have that? GG: Basically, everyone who wants to be in it has to sign up and they get assigned someone they need to shoot with a water gun. PH: Oh, yeah I’ve heard of that. I’ve seen it in TV shows actually. GG: Yeah, and the last one standing gets money. GG: Yeah, supposedly, but I never heard of anyone actually getting any money. Occupation: Student— Food Service Industry, Medical Group Volunteer, etc. Homecoming mums are worn by high school students and differ from person to person based on status, gender, relationship, etc. The practice is most common in Southern high schools- Texas in particular. 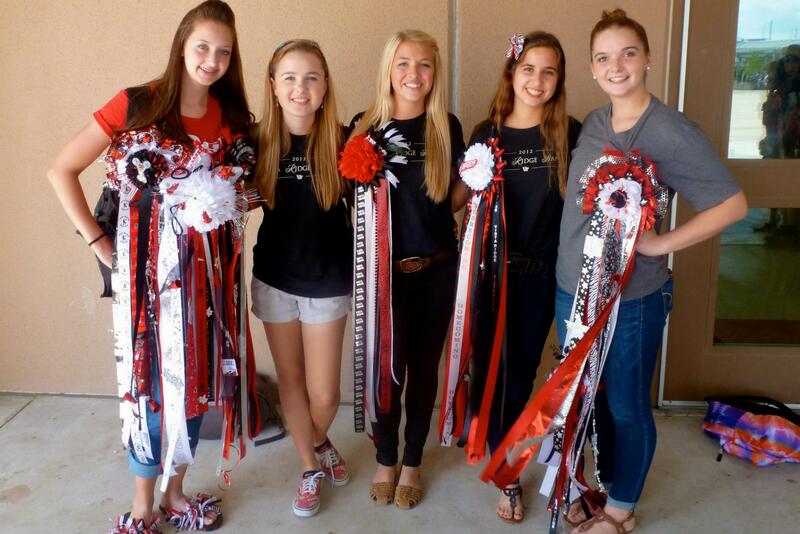 Homecoming mums are meant to be received as a gift from someone significant to the person wearing the object. An individual might receive a mum from the following persons: A friend, an organization, a parent/relative, a significant other (boy friend/girl friend), homecoming date, etc. A person is not limited by the number of mums they can give or receive and some people (women in particular) will often even make them for themselves if they want to be sure to have one for the day. Typically, the age of the recipient and grade level will determine the size of their mum. Women’s mums are always larger, but Seniors mums are also usually larger than underclassman mums. Seniors mums are also sometimes made will all white ribbons, decorations, and flowers. Mums are ornamental fake flowers that are usually around 6-8” in diameter and are attached to a back that has ribbons surrounding the flower on top, and dangling ribbons with decorations and letters. High schools in the area will have custom ribbons made with the high school logo or mascot as well. These ribbons and materials can be bought at craft stores in the region and even larger nation-wide craft stores will seasonally carry these items in their fall season. An example of stress that sell these items include, but are not limited to: Hobby Lobby, Michaels, Grocery Stores, etc. Mums worn by women typically have ribbons extending to a yard in length and are worn via safety pin over the heart. Men’s mums are approximately half a yard in length and are worn on their arm attached to a ribbon garter. These objects will often include materials that make them distracting and challenging to wear all day. Attached items may include: bells, whistles, mini-LED lights, trinkets, stickers, etc. Sometimes a person may receive more than one mum and will either attempt to pin them all to their shirt, switch them out during the course of the day, or pin them to their backpacks. Homecoming mums are worn on the day of homecoming to class and then later to the game. These flowers are also usually worn to a pep-rally that day before the homecoming game. Each mum is expected to be personalized with inside jokes, hobbies, or resemble the receiver’s/giver’s personality. Mums may also be given by a parent’s club of an activity or sold in smaller forms by a student organization. Examples of smaller mums are: Finger mums, hair mums, children’s mums, etc. Mums are usually kept and hung on bedroom walls by high school students. Women will often compare mums in class and use it as an almost competition to see who can get the most. Mums can add up in expense quickly. While all of the items individually are fairly cheap— the main flower only costing around a dollar or two. But as is the slogan for Texas, “Everything’s bigger…” the more trinkets, ribbons, and bells that can be fit on are better and considered more impressive. Small, simple mums usually cost around $40 where larger and more intense mums can range in the $100-$200 range. Mums are a very specific tradition, popular only in Texas (and parts of Oklahoma) and are huge, ginormous corsages. The NCAA recognizes the University of Missouri as the official place of birth of homecoming. In 1911, Mizzou athletic director Chester Brewer encouraged alumni to attend the game, and he gave them incentive to attend by having a huge celebration around the game that included parades and rallies. Mums are also not only worn for homecoming. Mums are sometimes given as decorations for the home. Before coming to USC, I made a USC themed mum to hang on our common room door in my dorm room. Expecting mothers may also receive baby shower mums that will hang on the door of the delivery room. These are often themed for either a girl or boy and have baby trinkets and ribbons attached (sometimes even baby toys or pacifiers). My cheerleading team sold mums the week of homecoming and provided a service for gentleman to order mums from our organization to be delivered the week of homecoming. At the game, each cheerleader also received a mum to wear on their leg for the game as athletes are not allowed to wear mums on the field. The football team will often wear a small carnation pinned to their uniform. The presented homecoming court will also remove their mums during the half-time ceremony. Personally, I also just love them. Upon graduating high school, I tallied up a total of around 12 large mums and a few other smaller mums that I pinned to a bulletin board. They’re a fun way to remember that year’s homecoming celebration, friendships, and interests over the past four years. “HISTORY OF MUMS.” The Mum Shop, www.themumshop.com/history-of-mums/. LJ: Can you tell me about El Paso High School. BH: So El Paso High is known as the oldest high school in El Paso, but beyond that, its also the most haunted high school in the city. It used to be um, the moratorium for world war 11 soldiers who had died in combat, but had no family members reclaim their bodies. So all these bodies were just left there…so as a result, it has been said that there are many ghosts that wander the halls of all of these veterans who have not been able to find peace. LJ: How did you learn about the ghosts? BH: I would hear them all the time when I was growing up. Um…I think I heard them more around middle school. There were kids who would go out to the school at night. So sometimes they would hear things.. I had visited the participant and her family in El Paso in March. This was recorded after. This is an example of how ghost stories are passed from one person to the next, immortalizing the event and history of the place. In this case, El Paso High, being the oldest has a lot of history. Not all of the stories may be true, but they are believed by a large amount of the population in El Paso. Being there, I also learned that since El Paso is so close knit, many of the stories and beliefs are shared by the community. Every place I went on my visit had some sort of history to it. There were plaques along the walls and in the pavement, but a lot of what I learned came from listening to native El Paso-ans speak about their city. My high school took spirit week super seriously and every single person got super hyped for it and dressed up every day. It was awesome. The whole week culminated on thursday nights when we had the annual Rock N Jock tournament which was a game of basketball with modified rules. Each player on the court dressed as a different character and had different limitations and scoring potential. Like the granny had to only shoot underhand but got a 3 points no matter where she shot from. And the traveler could travel all he wanted, but had to carry a small piece of luggage with him and wasn’t allowed to shoot. Scuba diver had to wear a scuba mask, wetsuit, and flippers, but got 5 free throws if he ever got to the line. The most important character of all though was the flamingo who had to hop on one foot whenever he was on the offensive half of the court, but got 7 points if he made any shot, 3 if he hit the rim, and 1 for just hitting the backboard. The game essentially boiled down to boxing out so that the flamingo could take shots and try to get as many points as possible. It was the best part of spirit week for sure. Once again, the idea of multiplicity and variation arises. While the game of basketball has official and standardized rules, this adaptation of the famous game also has its own set of very specific rules and regulations. While this game might not be “official” it represents a great amount to the informant. This game was the essential part in determining the winner of spirit week. There’s this huge tradition in theatre… our high school theatre… uh, department… where after we close a show, everyone in the cast and crew, like, steals one of their props or, like, a piece of the set or something. And we’re not technically supposed to do that, like, all the props and sets are supposed to, like, be deconstructed and put back in the vault, but, like, nobody actually cares. But um… yeah, my first show at the high school, I didn’t know this was a thing, so I didn’t take anything, which… I cry (laughs). But then for the spring show my freshman year, I… we did Pippin and I was one of the, like, farmer guys in Act Two, which, like… wooo, big role, I know, but, um… during strike, I almost forgot about that, but, uh… fortunately, I was just walking around backstage after school one day, and I found my hat that I wore for the show, which was just, like, a really redneck-looking baseball cap… and it was just lying on one of the tables backstage… I don’t know if, like, somebody forgot to put it back with all the costumes or something, but, like, yeah, I just decided to take it, because I’d forgotten to take any other props, and, like, you know, it was my first speaking role in a high school show… I mean, a small one, but you know, and so… yeah, I guess I just wanted to keep it. Uh… but yeah, I’ve seen people walk away with… like, whole pieces of sets that they just keep in their rooms, I guess, or, like… just other props… I know the middle school kids are starting to take props from their shows that they do, too, so… I guess it’s spreading (laughs). But yeah, I guess it’s kind of a problem within the theatre department, you know, like, we’re supposed to give them back so they can use them for future shows, but, like, in all honesty, they hardly ever do, they mostly just sit there in the prop vault for years… and, like, honestly, our school has enough money to just buy new props if they need to, so, like… nobody actually cares that we’re just stealing props and set pieces, and it’s… it’s pretty cool to, like, keep parts of shows you’ve been in or worked on, so we just do it. The tradition of stealing props or set pieces is a highly sentimental one. After working for weeks or sometimes months on a show that closes after a few performances, those involved in it want to keep pieces of the show to remember it by, especially since a show’s closing is usually very emotional (the same informant, as well as others, tell me of cast parties during which everybody cries the whole night). It also allows cast and crew members to show others or “prove” that they were a part of a particular show, since they have a keepsake from it. This tradition also points to high school students’ desires to break rules and get away with “sneaking around” behind the adults.